This is a great accessory for precisely collimating the optics of your Newtonian reflector telescope to achieve the best image the telescope can deliver.The approximately 2.6" long aluminum tube is a combination sight tube and Cheshire eyepiece. Peephole in the top and wire crosshairs at the bottom allow quick and precise centering of the optics. 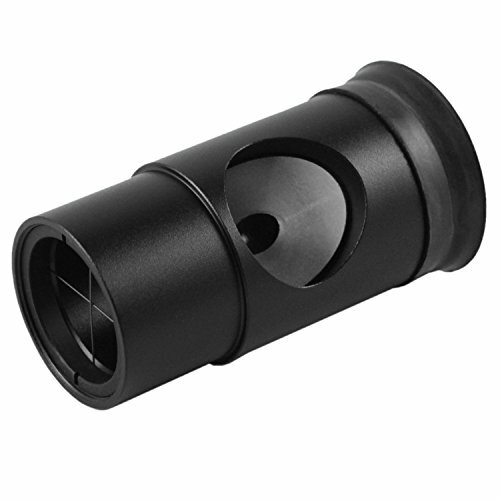 Fits in 1.25" focusers or in 2"-1.25" adapters. All metal construction. To use the collimating eyepiece, insert it into the eyepiece tube of your telescope and illuminate the angled ring. Sight down the tube and note the crosshair target. Center the First Mirroe (diagonal in a Newt, secondary in a CAT) on the crosshair, and adjust its tilt until the bright ring the collimator is producing is centered in the reflection. Next, adjust each successive mirror in the scope so that the image of the ring is concentric with the optic. Professional opticians refer to this as "working BACK THROUGH the system," ie. : adjusting each mirror in succession from the eyepiece outwards. In other words, before you align the primary on a CAT system, you have to have the secondary aligned, because it's the first thing you SEE while looking up the tube.